Materials: Remnant Silk Taffeta Fabric, Jacquard Lumiere Textile Paint, 90/10 Feather Down Inserts. Visual, 10.5” x 12.5” approx. 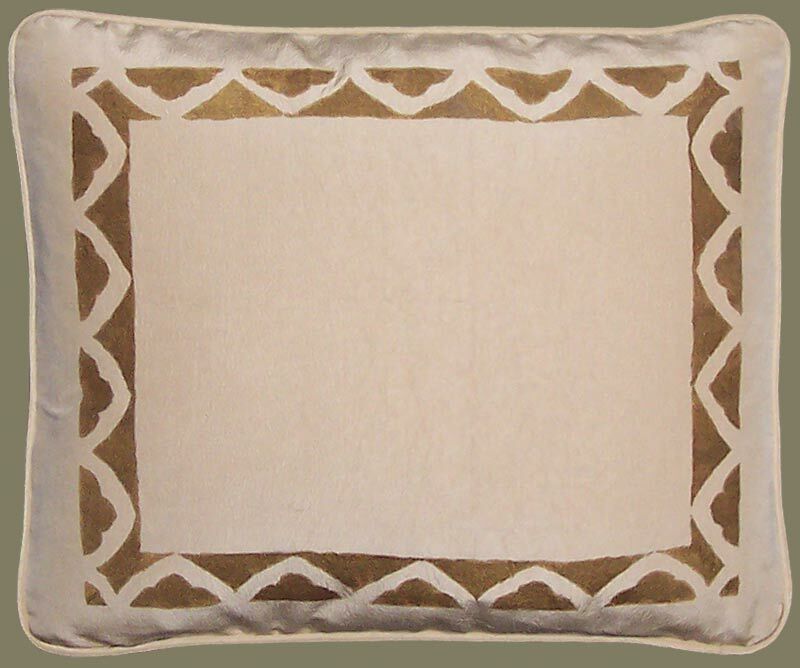 Description: Decorative Home Fashion Lumbar Pillows of an Original Carol Tate Hand Stencil Printed Border Print Design. Eco Friendly Remnant of Silk Taffeta Fabric was Pre Washed and Shrunken to Achieve a Slight Crinkle Effect, Then Hand Stenciled in a Tarnished Old Gold Metallic. Self Welt, Feather Down Inserts, High End, Hand Stitched Closure. A Pair of Eco Friendly Artisanaware Accent Pillows Evoking an Olde World Flavor, And Inspired by Euro Textile Surface Design.